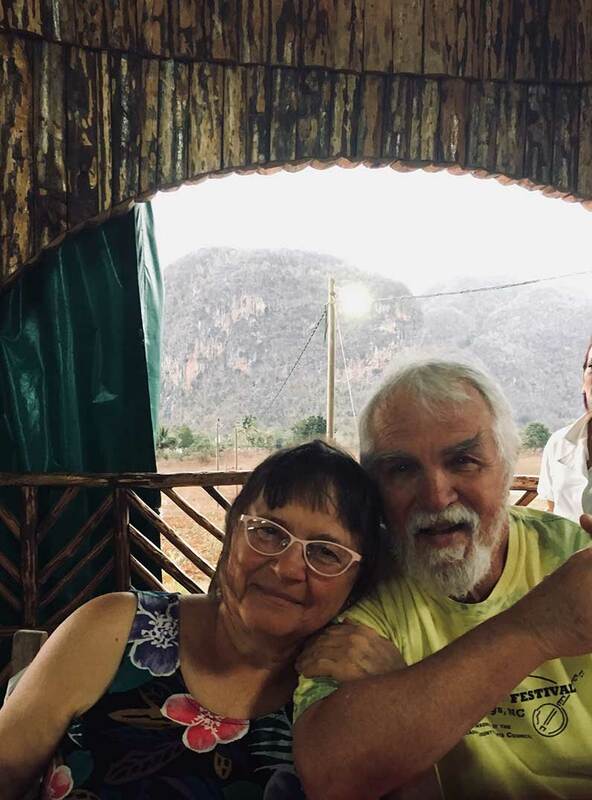 Cindy Trisler and Rod Bowling in Cuba, March 2018. Thank you to Cindy of Mudluscious Pottery and Gardens for writing this reflection. I’ve never been on a cruise and don’t particularly ever want to go on one. I’ve also avoided group vacation tours—too expensive, too confining. I’m glad I made an exception this time for the 2018 Cuba Agroecology Tour. Through Organic Growers School, I got to experience and learn things that would have been impossible to discover on my own. So, what was so special about it? First, the local guide was brilliant and eager to share all she knew about Cuban art, architecture, popular culture, history, and agriculture. 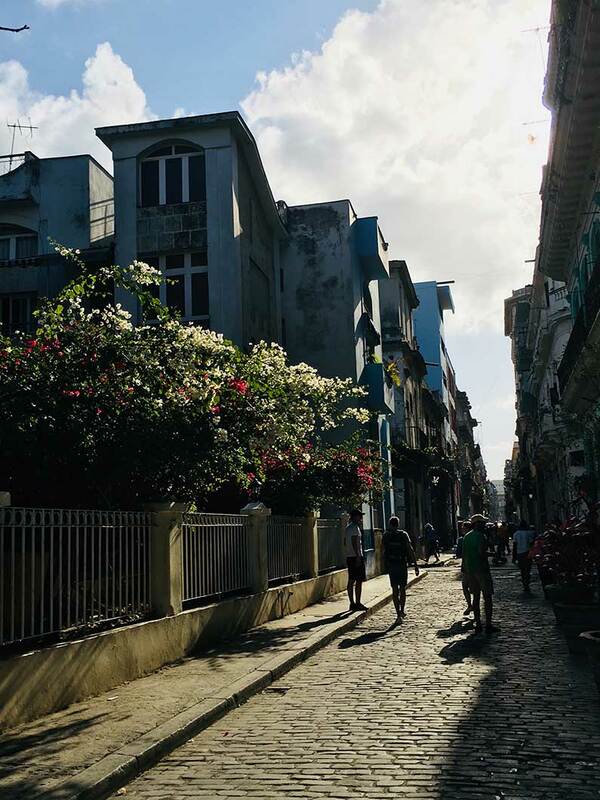 On a walk around Havana, we learned about things as diverse as Hemingway’s hangout, colonial architecture, temporary housing for people displaced by natural disaster, the food rationing system, neighborhood medical clinics, and where to go at night to hear real Cuban music. We visited eight very diverse organic farms. The first farm we visited was an organic urban farm in Havana. It was founded on wasteland in the 90s when the Soviet Union collapsed and Cubans had no access to fertilizers and petroleum. They had to go organic or starve. Every animal with any resemblance to an ox was recruited and trained to work the gardens. Forget about eating steak. Hungry city slickers figured out how to compost with worms, deal with insects, plant, grow, and harvest. Fortunately, there were still “old-timers” around who knew how to handle draft animals. They were recruited to teach the younger generation their art. Livestock in Cuba are abundant, and used for their manure and as draft animals. 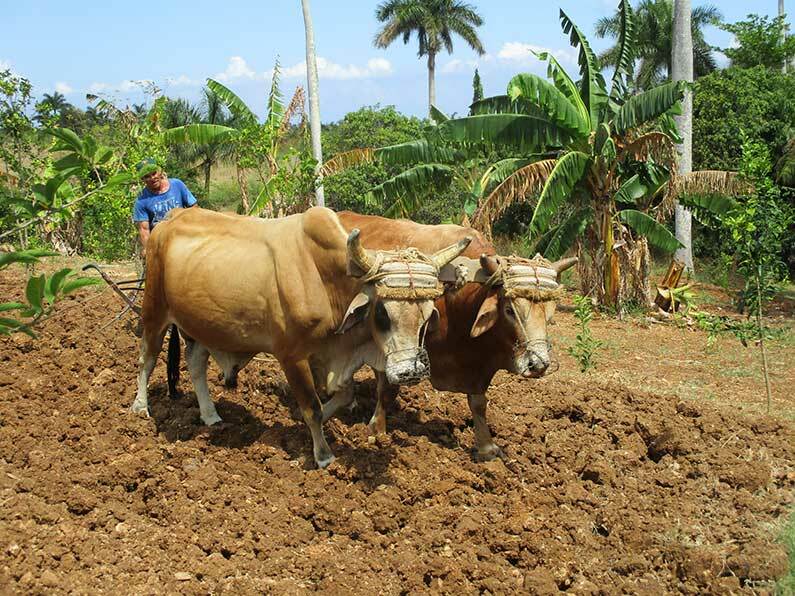 Twenty-five years later, organic Cuban farmers now have real oxen and beautiful horses to work the soil. The oxen are particularly well cared for. Their coats are like velvet. Their droppings are treasured. Whenever you see work animals outside the farms, there is a burlap collecting bag tied to either side of the animal’s rump, stretched to the wagon and tied on either side there. This helps keep streets clean and saves the precious resource of “horse biscuits” and “cow pies”. The manure is taken to a collecting point and, after composting, is put into worm beds for further enhancement. Tropical soil tends to leach out its nutrients rapidly, so rebuilding the soil is a constant struggle. Those burlap manure catchers are, for me, a symbol of the ingenuity and frugality of the Cubans. When they can’t find seedling containers, they cut beer cans in half and start their tomatoes in those. The simplest tool, like a thermometer for checking compost, is unavailable or unaffordable, so they jam a length of rebar into the compost pile and check the temperature by grabbing the bar to see how hot it is. 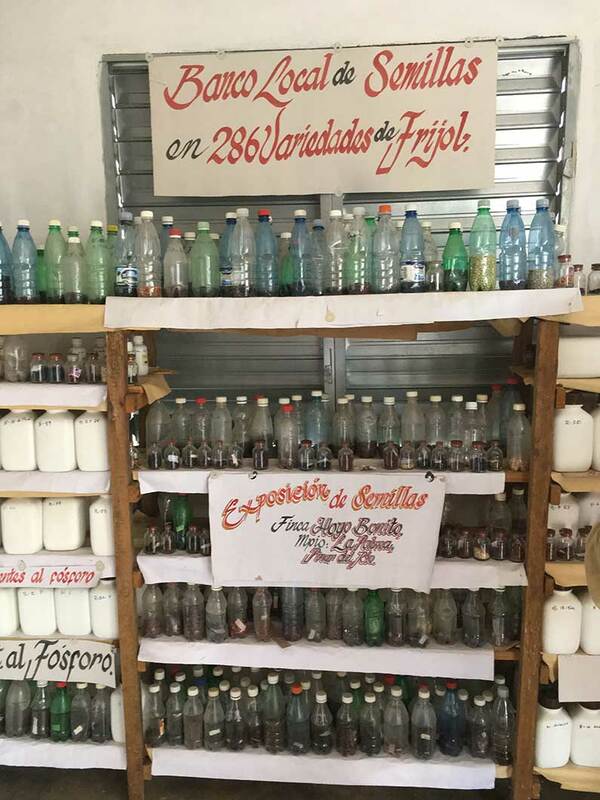 Every plastic water bottle is cleaned and dried and repurposed to store and sell honey, coffee beans, garden seeds, and locally made hot sauce. 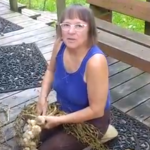 Seeds are as precious as gold in a country that relies on organically grown produce. Up to 85% of Cuban crops are now organically grown, and every farm we visited was run by people who are impassioned about organic methods. It is especially notable that many of the leaders on these farms are women. We found farmers and Cuban people in general, including government officials, eager to discuss their country’s past mistakes and future challenges. They are masters of wry humor, persistent in the face of setbacks, and optimistic despite unbelievable challenges. In short, they are like a breath of fresh air. Ever stuck your head into a hive of bees and sucked organic honey through a straw? Well, I have. They were non-stinging native Cuban bees (but I later learned they can bite). 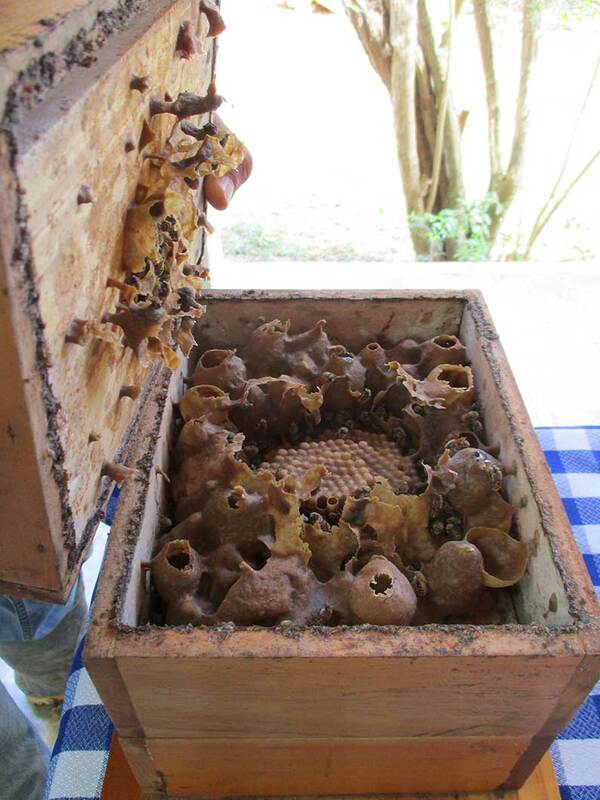 Honeybees and their organic honey are huge exports from Cuba. How about taking a two-hour horseback ride through the gorgeous Vinales Valley? Well, I have, and I hadn’t been on a horse in 50 years. 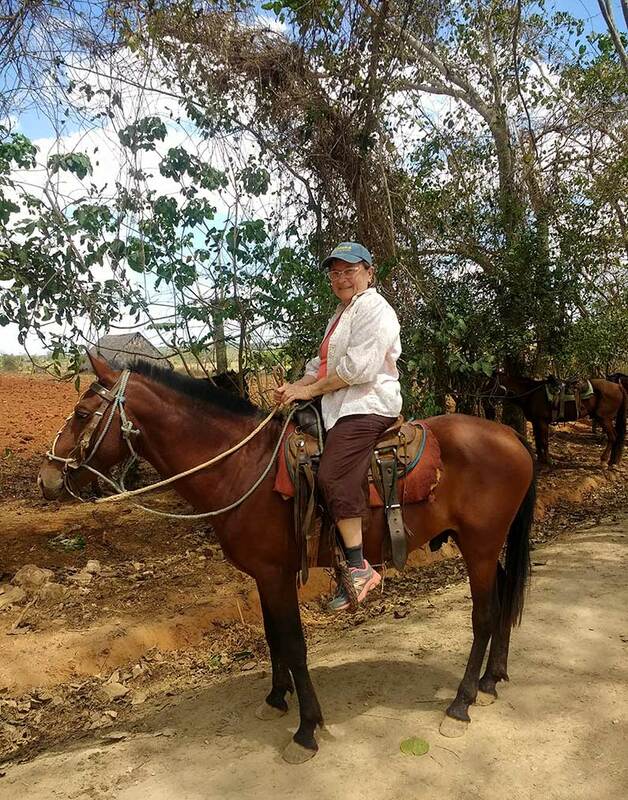 My horseride in Vinales Valley. 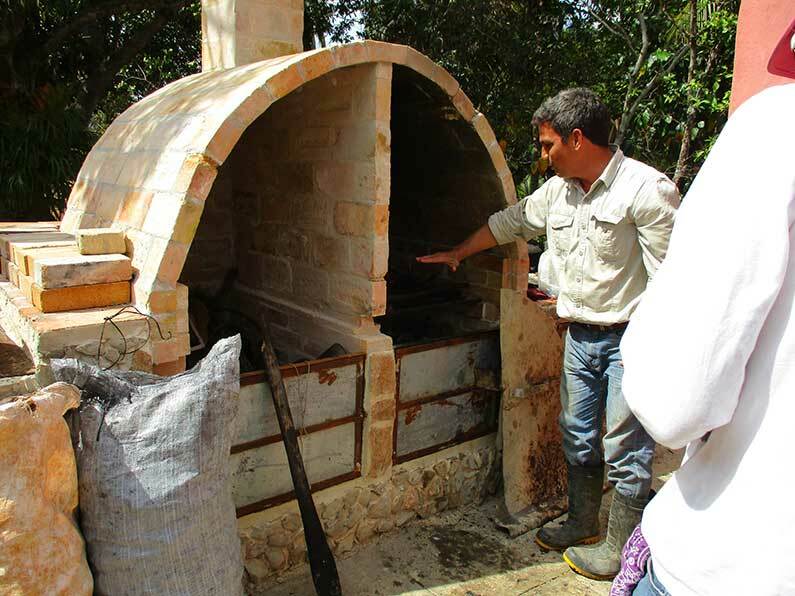 How about eating backstrap pork—locally butchered and roasted overnight in a handmade oven and fired with handmade charcoal on an organic farm? Yum. Roasting some seriously local fare in the pit roast. Or tasting fruits you’ve never even heard of? Or watching an elder artisan roll a cigar in a dimly lit tobacco barn? Or drinking a shot of Cuban coffee laced with rum at mid-morning on a farm visit? Or hailing a horse-drawn cart to purchase a coconut? Or enjoying a dance lesson with Cuban instructors? Or riding in a ’52 Chevy taxi down a highway to go birding? All of these things can happen in Cuba. 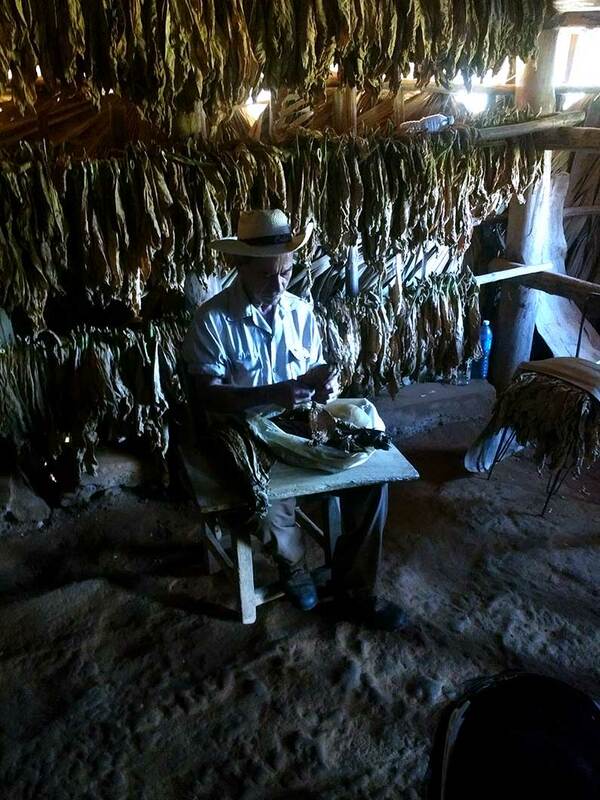 Rolling cigars in a tobacco barn in Vinales. We were told it could be a life-changing trip. It was. Open your mind and let it be blown! Be prepared to rethink everything you thought you knew about Cuba. Cubans will inspire you to be a better person.